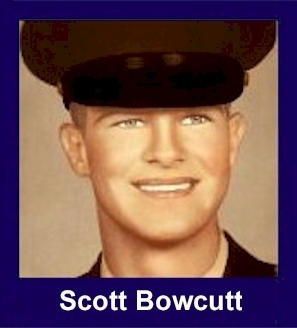 The 35th Infantry Regiment Association salutes our fallen brother, PFC Scott Cannon Bowcutt, who died in the service of his country on March 21st, 1967 in Kontum Province, Vietnam. The cause of death was listed as Multi-Frag. At the time of his death Scott was 21 years of age. He was from Tremonton, Utah. Scott is honored on the Vietnam Veterans Memorial at Panel 16E, Line 129. The decorations earned by PFC Scott Cannon Bowcutt include: the Combat Infantryman Badge, the Bronze Star with V, the Purple Heart, the National Defense Service Medal, the Vietnam Service Medal, the Vietnam Campaign Medal and the Vietnam Cross of Gallantry with Palm Unit Citation. Scott is buried in the Riverview Cemetery in Tremonton. Scott was born February 8, 1946 in Ogden, Utah. He graduated from Bear River High School. I had a service station and Scott worked for me after school and summers. After high school, Scott was attending Dixie College in St. George, Utah. He had started to lift weights and was really developing his body. We were informed of his death approximately one week after his death. Two servicemen arrived with the casket as honor guards. One or the other, or both, were at the side of the casket at all times. Both of these young men were very professional, very gracious, and attended to whatever needs the family might ask. Scott was buried in the Riverview Cemetery at Tremonton, Utah about the first week in April. My fourth son was born 21 April 1967 and we named him after Scott. In the last letter I received from Scott he said he had been reassigned to the motor pool and had to "Hump the hills for Charlie" just one more time. He had been in Vietnam just six months. His name is on a memorial in the town square. Scott was a very honest person. We shared one bedroom while going to Dixie Jr. College in St. George, Utah. We both worked at different gas stations after school to pay our own way. He was just a real pleasure to be around and would do anything he could to help a friend. I was drafted and Scott was too. I have always wondered why I was lucky in being sent to MP school while Scott ended-up in the infantry. Oh, we had our times, Tet '68, lots of ambushes when we escorted convoys, and rockets into our base camp. But nothing like what you guys went through. I read the story last night, brought tears to my eyes. I know Scott would have bravely fought to the end. My heart goes out to him and to others who were KIA or survived that big battle. For heroism in connection with military operations against an armed hostile force in the Republic of Vietnam. Private First Class Bowcutt distinguished himself while serving as a Rifleman in the 3rd Platoon, Company C, 2/35th Infantry, which was on a search and destroy mission in the Plei Trap Valley. When his unit became engaged with numerically superior enemy force, Private First Class Bowcutt refused to take cover and began to deliver a heavy volume of fore on the hostile positions. It was during this daring act of bravery that he was fatally wounded. Private First Class Bowcutt's personal bravery and devotion to duty are in keeping with the highest traditions of the military service and reflect great credit upon himself, his unit, and the United States Army.